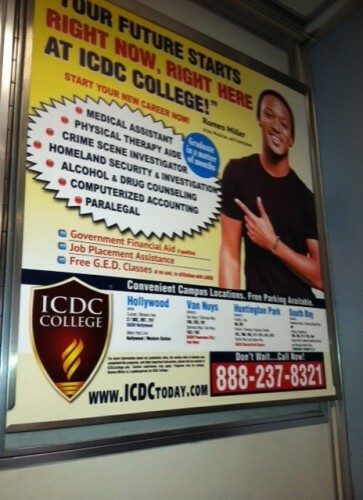 I was travelling on the Metro Expo Line when I noticed an advertisement featuring Percy Romeo Miller as an endorser for ICDC College. Yes, the same Percy Romeo Miller who played basketball for USC and likely earned the distinction of being the most famous bench warmer in college basketball history. Miller also played basketball at Beverly Hill High (Calif.). But more importantly, he was the best friend of DeMar DeRozan, a top high school prospect who currently plays for the Toronto Raptors. Miller logged only 19 total minutes as a Trojan, scoring five points. But he did lead the Pac-10 in taunts from opposing fans. DeRozan would not argue against Miller’s claim. Realizing his future was not in basketball, Miller left USC before his junior season to return to his entertainment career. He has since competed on Dancing with the Stars and appeared in movies such as Madea’s Witness Protection.